Christian Constant has a mini-empire of restaurants in the 7th arrondissement, taking over an entire side of a city block. On one corner is the Café Constant, bookended by his upscale bistro, Le Fables de la Fontaine. Violon d’Ingres was his high-end joint in the middle until he decided to go ‘downmarket’ and turn it into a more everyday dining experience. With linen table runners replacing the starched tablecloths and waiters shucking their Hugo Boss togs (which the menu duly noted), the food is some of the best in town and now it’s more accessible to many more diners. I had a terrific roasted Guinea fowl braised in a casserole, and learned an obscure new French word; “luttée”, which I thought meant ‘fight’ (lutte), although here it meant a luting paste. They’d given us both English and French menus, and the morel mushrooms with my Guinea fowl were just noted as ‘mushrooms’ on the English menu and the little crinkly fellas I got were much better than les champignons de Paris, white button mushrooms: an anglophone might have dissed this and ordered something else, which is yet another reason to learn French. Or English. After the waiter scraped off the luting paste (in spite of my grammatical errors and typos, see how educational this blog is? ), lifting the lid off the casserole, my lunch was carefully, and generously, spooned on to my plate. Our server was extremely charming and handsome—even without his Hugo Boss outfit—in addition to teaching me that there’s no such thing in France as a ‘fighting casserole’. Studded in the sauce he spooned over my pintadeau were little cublets of tender foie gras. A superb dish. My friend ordered correctly-cooked slices of rare duck breast with star anise that she pronounce “excellent.” Since I don’t do the vexing “everyone take a bite, and pass the plates around the table” thing (fyi, in case you ever dine with me: I don’t pass my plate, I don’t want a bite of food off your plate, and I don’t want people grabbing food off my plate while I’m eating), I took her word for it. Call me crazy—or whatever, but I do believe in sharing desserts. 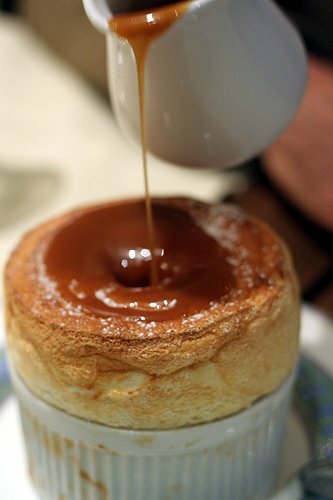 So we ended by splitting a sky-high, billowy Vanilla Soufflé, served with a warm pitcher of salted butter caramel sauce. The soufflé tasted a bit too much of vanilla “aroma”, in addition to the bean, which is common to use in Europe, although I prefer extract. But it was such a gorgeous dessert, I had to show it to you—twice. (To make it up to you for no pics of the waiter, who did eventually confess that he was wearing Hugo Boss socks.) And with the warm sauce, we were fighting for the last bits at the bottom. Aversion to sharing be damned. Moderately-priced, you can choose 3 courses from a rather varied menu, to create your own menu. Which, I should warn you, is a lot of food. So go hungry, or go à la carte. Lutté…I had forgotten this word for sealing the top of a casserole in dough. I learned this technique 25+ years ago from the French when we made daube de boeuf. Literally, an ancient pressure cooker that works like a charm. On 112 rue St. Dominique, (towards avenue Rapp) there is a great butcher, Boucherie de la Fontaine de Mars with superlative products and great rotisserie chickens. Across the street is a little boulangerie with very good baguette à l’àncienne. A “tip of the toque” to you, David. I always learn something new here. David, can you go back and save me a bite of your guinea hen? I’ll bring you some lamb. 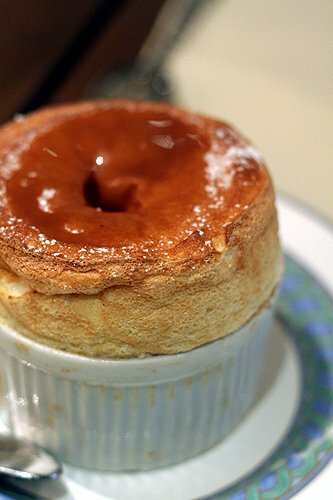 And yes, you’re fou, there’s no way I’d share a souffle. I can vouch for Les Fables de la Fontaine. I went there in the autumn and it was great food and good value for money – I’m still trying to figure out what was in their chocolate mousse. I’m heading back across the Channel next weekend and will have to check out another Constant establishment – perhaps Le Violon D’Ingres. I think perhaps that I could take a caramel sauce bath and not ever be sad…. *sigh* ou est la recette? For a moment, when I saw the photo I thought there was going to be one. Tant pis pour moi! 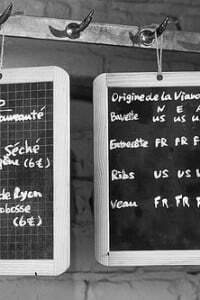 Thankyou for posting about vegetarian dining in Paris even though I haven’t looked at it. Sorry for sidetracking David… In your recipe for almond cake, can one make the almond paste at home by grinding almonds to an oily paste? I assume that ground almond wouldn’t do the trick… Thanks! Henry: It’s hard to get homemade almond paste to be as smooth as the stuff you buy. (Some recipes say you can make it in a food processor, but make sure your blades are super-sharp if you do. Places that grind their own use heavy-duty rollers.) Also store-bought almond paste is sweetened, so make sure to compensate if you’re going that route. My favorite almond paste is made by American Almond Products, but the stuff in the tube in the supermarket works fine, too. I don’t like sharing my meal either. When I go to a restaurant I always figure out exactly what I want to eat, putting the first and main course together in the particular way that I like. I don’t want a lot of random tastes to interfere. But, agreed, dessert is okay! We just ate at Les Cocottes in March and had an amazing dinner! I only just learned all about M. Constant and his little restaurant empire. I very much enjoyed our dinner there a few months ago. I would go back in a heartbeat. 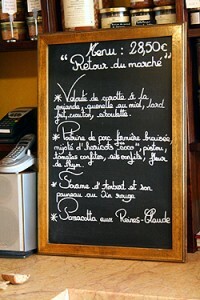 Haven’t spent a lot of time on Rue St. Dominque, but found a good chocolatier there as well — Gregory Renard. Every trip to Paris has me hitting Christian Constant for a box of his chocolates at his store by the St. Placide Metro. I’m speechless it looks so good. Your first image with the caramel dripping is brilliant! My dad took us to New York City for dinner to a nice restaurant as children quite often. He always reminded us when ordering that;we could order whatever we wanted. But remember, a la carte means “without the plate”. Of course we chose from the other side of the menu. I think I will go hungry. What an amazing dessert! Beautiful photo. I had an amazing meal this weekend at Osteria Mozza in L.A. My first time there. I highly recommend it. Going to Paris on Sunday and plan to visit as many of “David’s” places as possible! As much as I enjoy your blog, David, I’m gonna have to disagree on this one. My partner and I had dinner at Le Violon d’Ingres in December and, well, were decidedly underwhelmed. The waitress dropped the menus on the table with a loud “plunk” which caused the neighboring table to glance over and the butter they served with our bread had just come from the fridge and kinda tasted like it. You can always tell how good a restaurant is going to be by the butter they give you. Room temperature and spreadable and tasting like heavenly butter? Oh, it’s gonna be good. Still chilled, difficult to spread and tasting more like a cold fridge. Well, I hope it gets better. Our first courses were rather bland and by the time we hit our Mains we knew we were either there on a bad night or it just wasn’t living up to it’s hype. Had the service been better, it could have been a nicer experience, but we got the strong sense their main interest was in turning over our table tout suite! In fact, we felt so unwelcome we skipped desert. Let me say that again. We SKIPPED DESERT! For two chunky Americans, that’s saying something!! Won’t be going back, but, fortunately, we have several fantastic go-to spots we absolutely adore. I had to laugh – bc when I arrived on your site today, I actually couldn’t decide if I should first click the Fritos or the Souffle. Thankfully, (phew) the latter won – but you can be sure I’m heading straight over to the Fritos to glean what you have to say about those delicious devils right now. Hi Jonathannyc: That’s too bad, because my experience was such the opposite. When I ate there, the butter was sitting on the counter en baratte; in a big chunk, and the waiters were lopping of pieces of it for the tables. I almost ate the whole morsel by myself—ok, I don’t believe in sharing butter either! My husband and I are going to Paris in 3 weeks and can’t wait! Your blog has been a tremendous resource – thank you! We are trying to decide between Au Trou Gascon and Le Violon d’Ingres. Hopefully we will have time to do both, but if we had to pick one which would you suggest? Nicola: I haven’t been to Au Trou Gascon in quite a while. But if you’re looking for hearty food, last time I went, it hit the spot. Le Violon d’Ingres is lighter fare. You might be interested in an article I just wrote for Forbes Traveler: Paris Foodie Favorites, which lists places to get some of the great French classics. Thanks for responding so quickly. And thanks for providing that link – that is just the kind of information we were looking for. Your blog has been a great help for us in planning our trip. Thanks again! I am SO incredibly jealous, sigh. 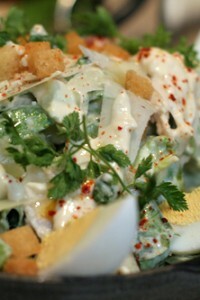 I have fond memories of this light, perfect, and slightly salty creation. I also remember the vast block of butter on the far table. Why do I live in the states?